Now, foraging skills are vital, in my opinion, but man cannot live by bread alone — so I like to know how to make my favorite hot sauce and salsa! I’ve shared my recipes in this article but there are simply dozens more in books like this one. It has the word ‘fiery’ in its title — how can you possibly go wrong? Now, it may be true that some will be able to survive by living off the land; I don’t know exactly what will happen. However, you do have to eat and knowing how to get the best out of whatever food you have is important, which is why I put these tips together for making the most out of your food storage. Good food improves morale and keeps everyone a bit happier. Learn all the skills you can to become as self sufficient as possible. In my case, I need my hot sauce! Hot peppers can be uncomfortable to work with, kind of like pepper spray. If you are not used to working with them, you may want to consider wearing gloves and a mask, like this one that protects both your eyes and nose. My wife works with habaneros on a regular basis and does not use any protection, but keep in mind that she has done this for many years. I would also suggest working in a well-ventilated area. A fermented hot sauce will have a decent shelve life without refrigeration if canned or kept in brine. 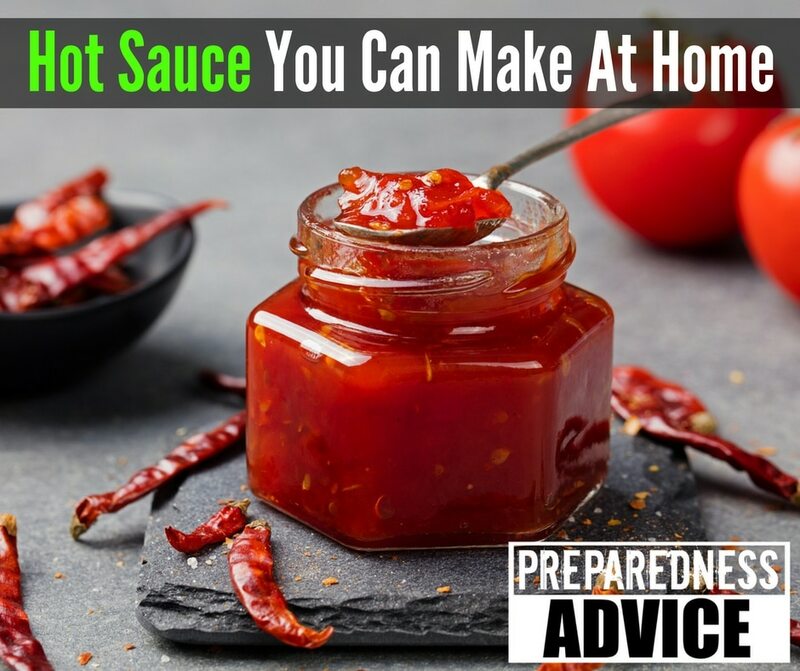 To make this type of hot sauce, you need to extract liquids from the peppers in a method similar to that used to make sauerkraut, as I explain in this article. Start out with some good red-ripe peppers. If you want to tone the sauce down a bit, you can throw in some green ones. We would probably use habaneros or Serranos. You may want to start with something a bit milder. Here’s an excellent list of all the different peppers and their heat levels. First, chop off the stems and then grind the peppers into a medium to fine mash with a food processor or hand grinder. Pour the pepper mash into a ceramic crock or a glass or food-grade plastic container. Salt does two important things: it extracts water from peppers and adds flavor. The ratio of mashed peppers to salt is roughly 1 1/2 teaspoons of salt per cup of mashed peppers. Mix the salt into your mash. As the salt extracts the water it should completely cover the mash and prevent it from being exposed to air. If you’re not pulling out enough water to cover the mash, add some salt water. IMPORTANT: Be sure to cover the mash with a plate which has a heavy object on it to keep the mash below the level of the brine. The brine is the protective barrier that keeps the mash from spoiling. If the brine level starts to lower from evaporation, add addition water. Store your crock at room temperature and cover the container with a towel to keep out dust. Be sure and check on it frequently to make sure the liquid is covering the mash. Let your mash ferment for at least a month to allow the flavor to improve. After 3 to 4 weeks, add white wine vinegar, or other seasoning to taste, and age for approximately another week to allow the flavors to blend. If you want you can strain your sauce through a fine mesh like this one. This removes the seeds and gives it a smooth, pourable texture. Your hot sauce should easily keep for several months. Store it in the refrigerator or can it. I have to add my own recipe for salsa — one that has been in my family for 3 generations now. When I first made it for my wife, then fiancee, she started eating it with a bag of chips and didn’t stop until the salsa bowl was empty. It was at that moment, I suspect, that she decided she had definitely made the right decision in accepting my proposal. Pour warmed liquid into a bowl and add 1 large can tomatoes (chopped or pureed), 1 chopped white onion, and chopped jalapenos to taste. Sometimes, against my protests, my wife will add a handful of chopped cilantro. Weevils in Your Food, How to Deal With It. This entry was posted in preserving foods and tagged food storage, peppers, recipe. Bookmark the permalink. Your description is how my late Aunt in Sierra Vista, AZ made hers. She used Serranos. As I do. Thanks for posting this. It brings back pleasant memories. Now a how-to on Tortillas 101 for Anglos! how much white wine vinegar or other flavoring do you add?